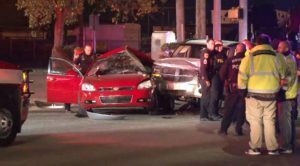 Houston (January 28, 2019) – Early Monday morning a woman was killed in a crash by a suspected drunk driver. The car accident occurred around 12:30 a.m. at the intersection of McCarty Road and Market Street in east Houston. According to Metro Video, the man was driving a Dodge SUV traveling northbound on McCarty when he ran a red light and T-boned the woman driving a Chevy Impala. The woman died at the scene. She has not been identified. The man suffered minor injuries. He could face an intoxication manslaughter charge.